GAO-11-394T: Published: Feb 17, 2011. Publicly Released: Feb 17, 2011. Comptroller General Gene Dodaro's opening statement during testimony about GAO's High Risk List before the House Committee on Oversight and Government Reform on February 17, 2011. Video provided courtesy of the House Recording Studio, Office of the Chief Adminstrative Officer, U.S. House of Representatives. The federal government is the world's largest and most complex entity, with about $3.5 trillion in outlays in fiscal year 2010 funding a broad array of programs and operations. GAO maintains a program to focus attention on government operations that it identifies as high risk due to their greater vulnerabilities to fraud, waste, abuse, and mismanagement or the need for transformation to address economy, efficiency, or effectiveness challenges. This testimony summarizes GAO's 2011 High-Risk Update, which describes the status of high-risk areas listed in 2009 and identifies any new high-risk area needing attention by Congress and the executive branch. Solutions to high-risk problems offer the potential to save billions of dollars, improve service to the public, and strengthen the performance and accountability of the U.S. government. This year, GAO removed the high-risk designation from two areas--the DOD Personnel Security Clearance Program and the 2010 Census--and designated one new high-risk area--Interior's Management of Federal Oil and Gas Resources. 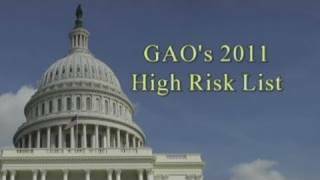 These changes bring GAO's 2011 High-Risk List to a total of 30 areas. While many positive developments have occurred, additional progress is both possible and needed in all 30 high-risk areas to save billions of dollars and further improve the performance of federal programs and operations. Congressional oversight and sustained attention by top administration officials are essential to ensuring further progress. The high-risk effort is a top priority for GAO. Working with Congress, agency leaders, and the Office of Management and Budget, GAO will continue to provide insights and recommendations on needed actions to solve high-risk areas. Regarding the new high-risk area, Interior does not have reasonable assurance that it is collecting its share of billions of dollars of revenue from oil and gas produced on federal lands, and it continues to experience problems in hiring, training, and retaining sufficient staff to provide oversight and management of oil and gas operations on federal lands and waters. Further, Interior recently began restructuring its oil and gas program, which is inherently challenging, and there are many open questions about whether Interior has the capacity to undertake this reorganization while carrying out its range of responsibilities, especially in a constrained resource environment. While there has been some progress on nearly all of the issues that remain on the High-Risk List, the nation cannot afford to allow problems to persist. This statement discusses opportunities for savings that can accrue if progress is made to address high-risk problems. For example: (1) Billions of dollars are estimated in Medicare and Medicaid improper payments. The effective implementation of recent laws, including the Improper Payments Elimination and Recovery Act of 2010, and administration guidance will be key factors in determining the overall effectiveness of reducing improper payments in the Medicare and Medicaid programs. (2) Federal agencies' real property holdings include thousands of excess and/or underutilized buildings and cost over $1.6 billion annually to operate. If this issue is not addressed, the costs to maintain these properties will continue to rise. (3) Over the next 5 years, the Department of Defense (DOD) expects to invest over $300 billion (in fiscal year 2011 dollars) on the development and procurement of major defense acquisition programs. DOD must get better value for its weapon system spending and find ways to deliver needed capability to the warfighter for less than it has spent in the past. The High-Risk update contains GAO's views on progress made and what remains to be done to bring about lasting solutions for each high-risk area. Perseverance by the executive branch in implementing GAO's recommended solutions and continued oversight and action by Congress are essential to achieving progress. GAO is dedicated to continue working with Congress and the executive branch to help ensure additional progress is made.